The science of light and health. When you consider the lighting expert’s impact on the interior environment, it’s fair to say we have never had so much influence. Solutions have moved from the functional to the aspirational, with a growing trend for spaces to be designed for people in order to enhance their health and wellbeing. A vital aspect of health and wellbeing is healthy sleep. Disrupted, poor, or inconstant sleep can wreak havoc on our bodies, increasing the risk of serious illnesses, impacting our alertness, mood, and mental wellness. We have 37 trillion cells in our body, each with its own time clock. For our bodies to sleep properly, it’s vital that each cell is properly synchronised. This is the function of something called the suprachiasmatic nucleus (SCN), a tiny area of the brain located within the hypothalamus. The suprachiasmatic nucleus acts as our main timeclock, entraining within our cells what is best described as our body-clock or our ‘circadian rhythm’. Essentially, our circadian rhythm regulates a 24-hour cycle of sleep, wake, hunger, alertness, hormone release, and body temperature… and generally keeps us healthy. But, as a night-shift worker or arctic explorer will testify, this rhythm can become desynchronised and have major impacts on our health & wellbeing. Leading to higher rates of obesity, diabetes, heart attacks, and cancer. Ultimately, what all this tells us is that lighting – both daylight and artificial – plays a vital role in our circadian rhythms… and therefore our health and wellbeing. Considering we spend so much of our time in lit buildings, it is vital that we explore the possibilities for circadian-centric lighting design within our spaces. There’s a great deal of excitement about the potential wellbeing impacts that this new understanding gives to the lighting design of interior spaces. We have established that lighting design can have a fundamental impact on our health and wellbeing. 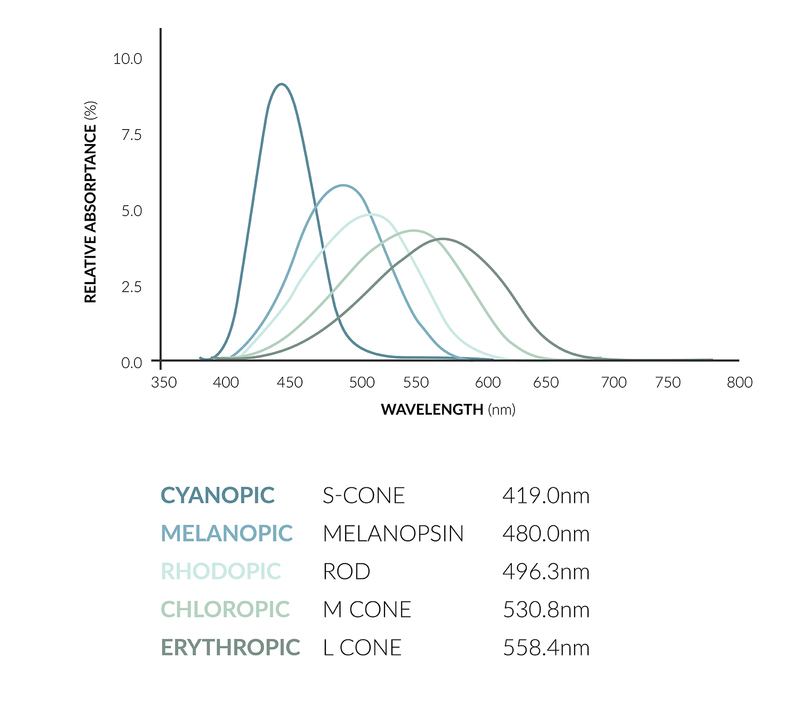 However, to truly unlock the potential of circadian lighting, it is vital that we understand the colour spectrum of daylight. The simplified diagram above shows how daylight changes from a warmer colour spectrum in the morning, to blue (the dominant spectrum in daylight) during the day, and then back again come evening. 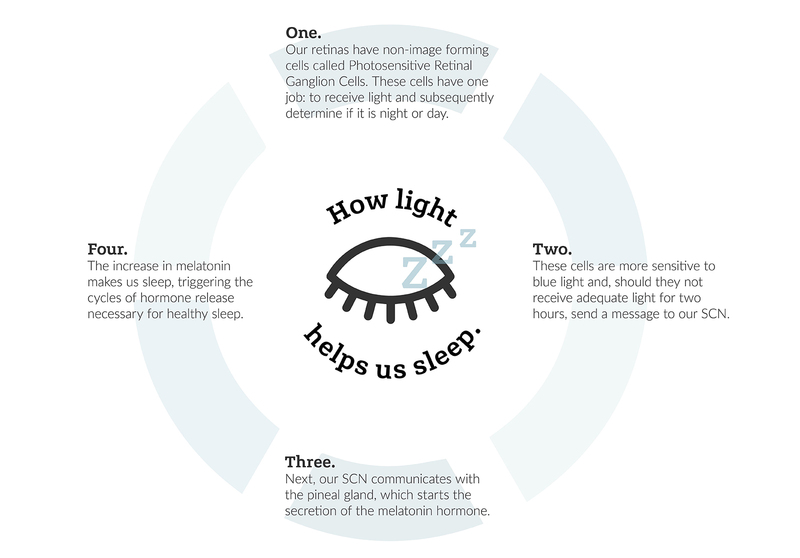 Our eyes and brain receive prompts from this natural day/night cycle and tell our bodies when to be awake and when to sleep. It then should come as no surprise to learn that bright blue light in the evening can disrupt sleep, and dark, warm-light interiors during the day can reduce alertness. Intense bursts of blue (or even red) spectrum light can temporarily increase alertness and concentration in a similar way to a cup of coffee… they act as a stimulant. In circadian lighting terms, the most sensitive wavelength appears to be this blue spectrum: about 480 nanometres (nm). However, the power of blue spectrum lighting has been known for quite some time; in the late 90s, research by lighting manufacturers suggested a jolt of blue spectrum light as a way to stimulate workers. The research not only highlights the potential potency of blue light, but also the deeply ethical questions that circadian lighting carries with it. However, more recently, the demand for wellbeing-focused spaces has gathered pace and, alongside it, our circadian system and its impacts on our health has been researched in greater depth. With LED light sources comes the ability to dim and colour mix, and together this trio has driven the installation of new dynamic lighting systems that can mimic the spectrum of daylight… circadian lighting. You may already be familiar with this concept: a lighting system, usually for offices (but sometimes schools or care environments) that carries out a colour temperature and illumination change throughout the day. Our circadian lighting design for Astra Zenica, in spaces where natural daylight couldn’t be the dominant light source. Instead, a Circadian control system cycles through from warm to cool white light. A circadian lighting system is, in essence, an artificial ‘sunrise to sunset’ that travels through illuminance levels and colour spectrums from a warm colour spectrum (2,700K) to brighter, cooler (6,500K and upwards) and back again. The thinking is that, by providing appropriate-intensity blue-spectrum light during main daylight hours and warmer spectrum when the body is gearing up or winding down, you create a suitable environment for melatonin suppression (alertness) and cortisol release to control body temperature. Circadian lighting systems and controls. The main thing we need to be aware of when considering circadian lighting is that it’s difficult to establish for certain that it ‘works’. A number of case studies in schools, hospitals, and offices suggest that circadian lighting systems have been successful at improving alertness and wellbeing, but often these are ‘before and after’ impressions of the environments. Though good research is available it is often not definitive, and contradictory papers only add to the confusion. One of the key questions debated is what level of exposure to blue spectrum light is required from artificial sources in order to have a valuable impact? Can current artificial lighting systems meet similar criteria to the spectral intensities of natural daylight? Quantifying the exact spectrum required for melatonin suppression has begun to be answered by scientists at the University of Manchester. The University of Manchester first proposed the ‘melanopic’ illuminance curve of eye sensitivity in 2011. In 2014 this was expanded by the same team to include all of the contributing cones and rods in the eye. Within the retina of the eye, rods take in low light, while cones are responsible for us seeing in colour – each one has its own sensitivity to light spectrum and each forming part of our visual and non-visual responses to light. This is called the α-opic Illuminance sensitivity curve. The a-opic Illuminance sensitivity curve, showing the different illuminance sensitivities of the cones and rods of the human eye. The new WELL building standard offers melanopic illuminance values measured vertically at face height as a key to creating healthy lighting. The German standard DIN Spec 6760 also offers metrics for ‘biologically effective’ lighting. The ethics of circadian lighting. In many ways, light can be considered a drug, having the potential for both beneficial and deleterious effects. These conflicting effects can occur concurrently, and in a single individual and context. If circadian lighting can be used to manipulate a brain on a biological level, then we must be extremely cautious with how it is used. Using light unnaturally to stimulate a physiological response in order to achieve greater productivity or concentration. Example: very cool spectrum or blue light during the day to saturate the eye with 480nm light and over-stimulate alertness. Using reasonable, considered lighting design to support a natural and considered light colour exposure. Example: lights that go warmer in colour and dim into the evening to support natural tiredness and sleep. One major issue is the ‘one size fits all’ approach. People are different: from our chronotype (how we sleep), to our geography, work patterns, diet, age, and subjective responses to light. We know the eye yellows and receives less blue spectrum light as we age, and that a person of 50-60 years secretes about 35 percent of the melatonin of a 10-year-old. We also know that personal preference and light quality is important in a person’s appreciation of their internal environment. While the science may favour cooler spectrum lighting during the day, it could be argued that preference, and thus perception of illuminated quality, may contradict this. Another key question is illuminance. Modern building standards have consistently tried to lower illuminance levels and allow more creativity in interior environments but research suggests that higher illuminances a more supportive to melanopsin. This is a major concern for energy loads in a modern, low carbon world. Public Health England has stated that the blue spectrum output of normal LEDs are not a risk to the human eye, but a circadian system would be looking to increase blue spectrum and it has been seen in rats that this can cause retinal damage. Short wavelength blue light hits the retina faster than long wavelength light, and research suggests this could cause oxidative stress in the retina tissue. This intensity of blue light has also caused the American Medical Association to express concern about “potential harmful human and environmental effects”. In addition, colour mixing between colour sources requires dimming, and dimming often causes flicker. Many “electronic” drivers for LEDs have high flicker modulation – similar to that of old fluorescent lighting that a generation said gave them headaches! Could a dimming or colour-mixing system cause detrimental flicker in the workplace? A human-centric future for lighting. While there are still many unanswered questions regarding circadian lighting and its adoption, the conversations are truly exciting. As lighting designers, we have always believed that good lighting was vital for creating spaces that work for people. For a long time, the psychological, and sometimes physiological, human responses to light have been almost intuitively understood… but this new scientific understanding takes the potential use of light to entirely new levels. One of the most exciting sectors is that of senior living, dementia care, and healthcare – where lighting could make great advances in people’s quality of life – not only for residents and patients but also for carers and support workers. The potential for other, more commercial, sectors also needs to be explored further. 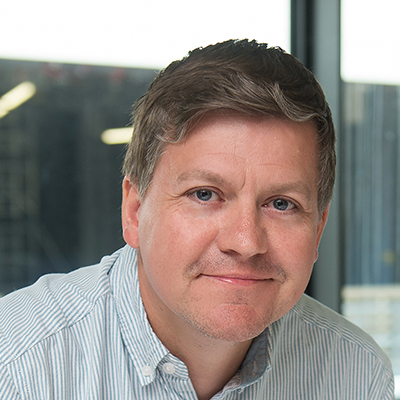 As lighting designers and engineers, we should be considering some of the main themes of circadian lighting, but also weighing up the ‘unknowns’ and concerns, before producing designs that claim to support a healthy circadian rhythm. For many of us the raison d’être of good ‘human centric’ lighting design represents the normal practices of our roles. It’s clear that, in trying to influence the physiology of people through light, there’s the possibility that we could lose sight of the simple objective of lighting: to create attractive and comfortable spaces that benefit people and improves the built environment for society as a whole. As a lighting designer, focusing on wellbeing is about understanding light’s impact on a space and how it can enhance a space either aesthetically, emotionally, and physiologically. Aesthetic: creating spaces we want to use and be in. Emotional: understanding the intrinsic, personal, and emotive relationships we have with light. Physiological: the impact of the light on the functions of our body. And the importance of our perception on these functions. 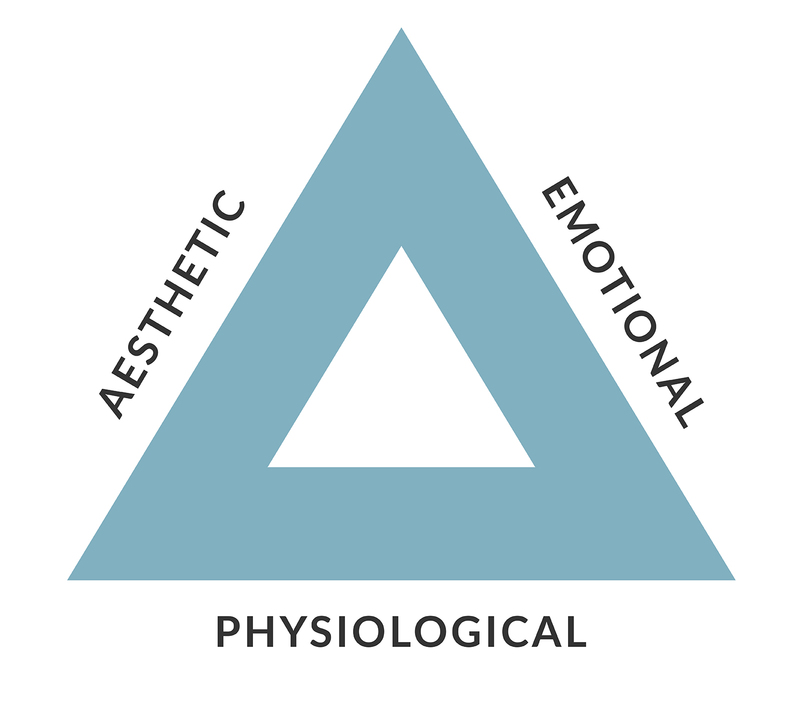 By using this trio of considerations, we can craft a lighting environment that is truly human-centred. In conclusion, with so many external influences affecting our daily lives, a lighting system, such as circadian lighting, isn’t going to single-handedly provide an answer to the question of designing for wellbeing. But it definitely could be part of the solution. Ultimately, harnessing our understanding of light’s physiological impacts in an ethical and considered way will help us create truly beautiful spaces that support a healthy, social, and happy society.